A serious safety infraction committed and covered up by a long-time employee resulted in termination. Victor Lewis started working at Winners Merchants in 1990 with a Grade 10 education and remained there until his dismissal on Aug. 1, 2013. Lewis was operating a forklift in the company’s Mississauga, Ont., distribution centre when the incident occurred on July 17, 2013. The movements of forklifts in the aisles of the distribution centre are restricted by the control of a locking wire buried in the concrete. Drivers must engage the locking wire before entering the aisle. There are visual and audio signs to alert workers when this has been done. On the day in question the forklift operated by Lewis came into contact with racking on aisle 77 in the distribution centre. The impact caused extensive structural damage, bending cast steel and jarring bolts out of concrete. It was necessary to replace the racking. At the time of the incident, a significant amount of product was being stored in the racking above the point of contact. The product did not fall, but if it had it could have resulted in serious injury to both Lewis and his fellow employees. Lewis could not explain how the accident could have occurred if the locking wire had been engaged. Following the accident, Lewis did not report the collision. Instead, he signed the forklift out for oil leakage. The damage done to the racking was not discovered until the following shift. When the employer inquired about the incident, Lewis remained silent. When directly questioned about the accident, he denied involvement and lied about being on particular equipment. The employer conducted an internal investigation that included review of computerized inventory records in the United States. Through its investigation, the employer came to believe that in addition to lying about his involvement in the incident, Lewis also falsified documents. The union denied this charge. During an interview on July 29, Lewis made a complete admission. The union stated this confession came before the employer had absolute proof, while the employer said Lewis’ admission came only after being confronted with irrefutable evidence. The employer was not prepared to risk injury to the grievor or other employees should Lewis be reinstated and commit another safety infraction. Lewis had been trained on the company’s safety policies and received refresher courses over the years, being retrained as recently as June 11, 2013 — just days before the incident. 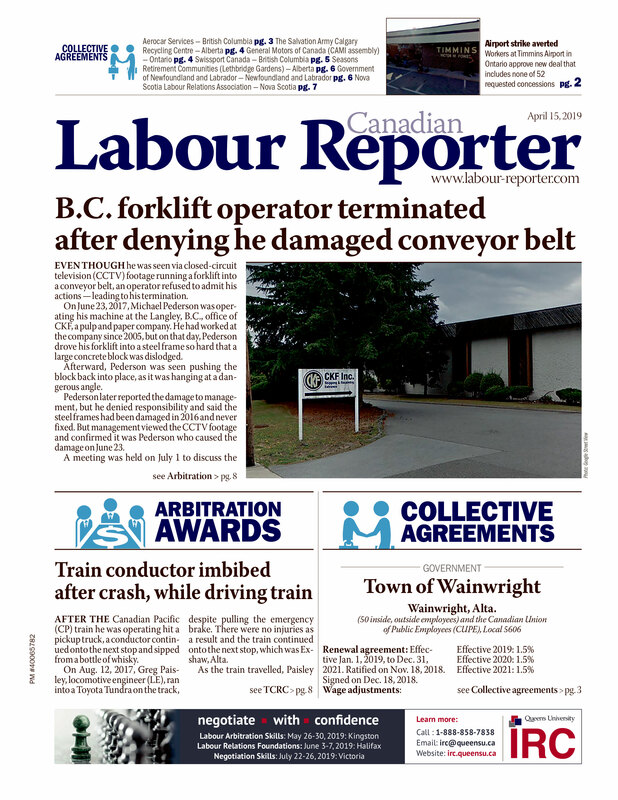 The grievor was disciplined for safety infractions in the past, but the two written warnings fall outside the collective agreement’s sunset clause. The employer submitted it was clear prior discipline had no impact on Lewis. Trust had been lost, the employer said, when Lewis actively misled the employer for 12 days while other employees were left under suspicion.